The Eustachian tube (ET) connects the air filled middle ear space to the throat. It's function is mainly to keep the pressure in the middle ear equalized with pressure in the outside. When the pressure becomes negative with respect to the outside world, the ear drum gets pulled inward. When pressure is positive, the ear drum bows outward. 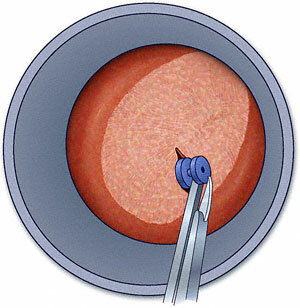 A valve near the opening into the middle ear allows controls this process. The valve is usually closed, which keeps bacteria and various other things in the mouth and nose from getting into the middle ear. It may be important to keep acid from the stomach from getting into the middle ear (Brunworth et al, 2014). It opens naturally when there is a big pressure difference between the middle ear and nose (such as when you blow your nose). It often can be opened by yawning, opening the mouth widely, and swallowing. The muscle that opens the ET, at least in some animals, is the tensor veli palatini (Gyanwali et al, 2015). Some talented people can open it voluntarily. When it cannot be opened easily, pressure differentials build up. Usually this results in a "full" feeling -- whether the ear is over or under-pressurized with respect to the outside world. There are other causes of "full" feelings -- such as Meniere's disease, but this is the only one that responds to "popping" of the ear. Inability to pop the ears can be a problem in persons who fly on airplanes and who Scuba dive. In many cases, however, this may be alleviated by use of special ear plugs. Fullness in the ears can be a very troublesome symptom that can also arise from TMJ (jaw joint) disturbances, migraine, and Meniere's disease. How people change the pressure (pop) their ears. This is called "Self Politzerisation", after it's inventor, Dr. Adam Politzer. Dr. Politzer devoted most of his career to the ET. Amazingly enough, there is presently a society named after Dr. Politzer. How pressure changes can (rarely) damage the ear. While generally, blowing the nose forcefully with the nostrils pinched shut or using the fancier name -- self-Politzerisation -- does not cause any harm, people who do this very frequently or use very high pressure can damage their ear drum. This can cause the ear drum to "sag", which reduces hearing and also alters ear test results (tympanometry). Extremely rarely, people who create very high pressure differentials in their middle ear, perhaps by Scuba diving, can damage the inner ear by causing a fistula. Smith and Tysome reviewed Tests of the ET in 2015 (Smith and Tysome, 2015). They concluded that "Currently, no single test could be considered a 'gold standard' for the diagnosis of ET dysfunction". Practically, ETD is diagnosed by talking to the patient, and identifying symptoms that clear with manipulation of the ET, such as by "popping" the ear. A ETD questionnaire was developed in 2014 called the EDTQ-7 (Schroder et al, 2014). We are dubious that a questionnaire is needed for this simple diagnosis. Van Roeyen et al (2015) reported that the ETDQ-7 was unable to distriminate between obstructive ET dysfunction and patulous ET. The questionnaire had good discriminant validity for ETD vs. healthy controls. Eustachian tube function can be evaluated formally by the process of measuring pressure in the ear using tympanometry, documenting that it is different than 0, then having the person attempt to open up their ET, and then measuring it again. If pressure changes, then the ET opened. If it didn't, either the pressure was normal to start with, or the tube didn't open. Eustachian tube function changes with age, and some disorders may derive from this (Suzuki et al, 2003). Allergies are common causes of ETD. Eustachian tube function may be poor for several months after a bout of otitis media (Caye-Thomasen and Tos 2004). The Eustachian tube may be open too much ("patulous"), close too much resulting in negative pressure in the ear, or open/close too much (popping). The patulous (open too much) eustachian tube is also diagnosed by noting that people have autophony (hear their own voice in their ear), an abnormal resonance to the voice (due to the tube being open), or the simple expedient of watching the ear drum move while the person breathes. The Japanese recently described another method involving testing hearing with masking noises inserted into the nose (Hori et al, 2006). While clever, diagnosis is generally so easy that procedures are unnecessary. ET that are open too much may let stomach contents reflux into the middle ear(Brunworth et al, 2014). . Also, reflux itself may injure the ET. Kilic et al (2018) reported in rats that pepsin/HCL and human bile was most injurious to the ET. Thus gastric reflux could be very damaging to ET function, and furthemore, it is not only acid but also other stomach constituents such as pepsin (think meat tenderizer), and bile that disturbs the ET. There are rare disorders where the ET opens regularly and periodically -- mainly palatal myoclonus. This is a fascinating condition where the palate moves up and down rhythmically, and is often accompanied by rhythmical oscillation of the ET too. The ET can sometimes be opened causing a clicking sound. The muscle that does this is probably the tensor veli palatini. Clicking from the ET is a form of objective tinnitus -- i.e tinnitus that other people than the tinnitus sufferer can hear. It should be distinguished from other objective tinnitus such as tensor tympani and stapedius myoclonus. Treatment of ETD is not very sophisticated or effective. For the usual type of ETD (closed), medications for allergy such as decongestants, systemic or local antihistamines and nasal topical steroids are commonly tried. We are particularly fond of using "Astelin", which is a prescription antihistamine nasal spray, as well as kits that involve irrigation of the nose with salt water. Occasionally, people with severe symptoms due to ET dysfunction may have a ventilation tube placed in their ear drum. This relieves the symptoms of ET dysfunction but creates a perforation in the eardrum which reduces hearing to a small extent as well as provides a potential entry point for infection. However, in most cases, it is worth it to find out if symptoms respond to ventilation of the ear. Recently Balloon Eustachian Tuboplasty (BET) has been used as a method of treating chronic obstructive ETD. Schroder et al (2015) reported success in "more than 70%". Similar results are reported by Tisch et al (2013), Maier et al (2015) and Ziong et al (2016). A systemic review of the literature by Jufas and Patel (2016), suggested that "there is a very narrow evidence base", and also that "There is a high risk of bias overall". We take this to mean that BET is not ready for wide clinical use. Still it looks rather promising. Methods of treatment aimed at "patulous" (abnormally open) eustachian tubes include Premarin nose drops or nasal spray (compounded 25 mg in 30 cc NS), and insufflation of boric acid and salicylate powder as described by Bezold. These agents are intended to close eustachian tubes, and would not be appropriate for persons who have plugged eustachian tubes rather than abnormally open ones. Oh et al (2015) reported using catheter insertion through the ear drum to occlude the TM. This is not commonly used. Oh et al (2016) also reported using "endoscopic autologous cartilage injection" (2016). In essence, they "chopped up" the tragus, and injected it into the "anterior and posterior aspects" using an endoscope placed through the nose. In other words, they plugged up the ET. They reported success in about 70%. It is plausible that this procedure might work, but we are a little surprised that the success rate was so high. Of course it would be difficult to attain a placebo controlled trial for this study. Si et al (2016) reported an "eardrum thickening approach", using a cartilage graft. We think that simply adding a weight to the TM, such as with a specially designed PE tube, would be a perferable approach as it could be removed. As a last resort, a patulous eustachian tube may be closed surgically (Rotenberg et al, 2012) and a perforation created in the eardrum. However, it is difficult to imagine a situation where this would be desirable. Gyanwali B, Li H, Xie L, Zhu M, Wu Z, He G, Tang A. The role of tensor veli platini muscle (TVP) and levetor veli platini muscle (LVP) in the opening and closing of pharyngeal orifice of Eustachian tube. Acta Otolaryngol. 2015 Dec 1:1-7. COMMENT: In the Pubmed abstract, these authors spelled "palatini" -- "platini". This would lead a reader to wonder if an article can be trusted about muscles that the authors cannot even spell. Maier, S., et al. (2015). "[Balloon dilation of the Eustachian tube in pediatric chronic obstructive Eustachian tube dysfunction patients]." HNO. Oh SJ, Lee IW, Goh EK, Kong SK.Trans-tympanic catheter insertion for treatment of patulous eustachian tube. Am J Otolaryngol. 2015 Nov-Dec;36(6):748-52. doi: 10.1016/j.amjoto.2015.07.003. Epub 2015 Jul 8. Oh SJ1, Lee IW2, Goh EK1, Kong SK3.Endoscopic autologous cartilage injection for the patulous eustachian tube. Am J Otolaryngol. 2016 Mar-Apr;37(2):78-82. doi: 10.1016/j.amjoto.2015.12.002. Epub 2015 Dec 9. Rotenberg BW, Busato GM, Agrawal SK.Endoscopic ligation of the patulous eustachian tube as treatment for autophony. Laryngoscope. 2012 Oct 15. doi: 10.1002/lary.23635. Sato T, Kawase T, Yano H, Suetake M, Kobayashi T.Trans-tympanic silicone plug insertion for chronic patulous Eustachian tube. Acta Otolaryngol. 2005 Nov;125(11):1158-63. Schröder S, Lehmann M, Sauzet O, Ebmeyer J, Sudhoff H. A novel diagnostic tool for chronic obstructive eustachian tube Dysfunction-The eustachian tube score.Laryngoscope. 2014 Sep 12. doi: 10.1002/lary.24922. Tisch, M., et al. (2013). "[Eustachian tube dilation using the Bielefeld balloon catheter: clinical experience with 320 interventions]." HNO 61(6): 483-487.